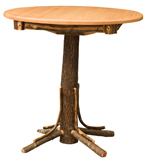 Top Diameter: 40", 46" or 52"
- Single pedestal tables are not able to self store any leaves. This table's ultra-simple construction makes an elegant statement whether you use it in a rustic or ultra modern setting. The Homestead Cocktail Table with Shelf is made with simple block-shaped legs for a chat in a minimal cabin setting. 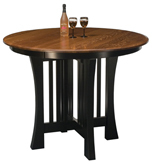 This little pub table makes a statement with its distinctive hardwood shapes and sturdy pedestal.